It is no secret that print newspapers, magazine and the broadcast evening news model is at best losing a majority of their influence and reach and looking at many trends actually dying. Now the alarming thing about this is not actually that venerable brands like Newsweek Magazine or ABC’s Nightline News become extinct but that good journalism itself is lost to the world. We wrote a couple of weeks back about the new Online Media Empires usurping the traditional titans like Disney and Newscorp, disrupting them from outside their world first rather than from within. People view this disruption as the growth of short form, sound bite, sensationalist news with little substance. Thus this leads to less informed populace, a dumber society and ultimately a weaker economy and democracy. That all sounds dramatic BUT is is true? It is certainly evident in the newspaper business from the above chart that newspaper revenues in this country have fallen off the proverbial cliff and landed today smack back in the 1950s. 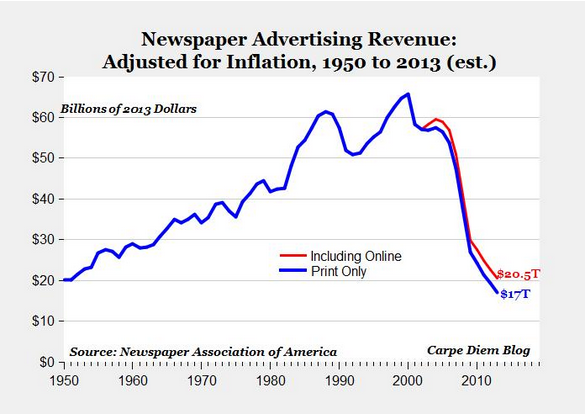 Most of newspaper revenue comes from advertising not from the subscription price to buy the paper. Ultimately it was the major newspaper’s job to get as many eyeballs on their paper each day and thus increase their circulation numbers as the higher that number was, the more they could charge advertisers. Certainly other factors like demographics, income and locale of the publication played a factor as well but they were secondary and also in case of demographics more prone to error. People often wonder whether this drop in print revenue was hastened first by circulation drops due to the initial rise of the real time coverage of the 24 hour cable news networks and the growth of the internet. Alternatively was it hastened by the better options of businesses, advertisers and consumers to promote their message in new mediums like the Internet is far more effective and targeted ways. It is an interesting question given that from the above chart revenues peaked in the early part of the new millennium around 2002-3. Well CNN, the first of the 24 hour news channels launched in the 1980s and Fox News and MSNBC along with CNBC in mid 1990s (technically CNBC launched in 1989 but modern version was in 90s under NBC banner). So that means people had increasing access to news on demand and people think this blanket coverage of real time news by multiple outlets escalated substantially and changed behaviors with the triumvirate of events between 1996-1999; OJ Simpson’s Murder Trial, President Clinton & Monica Lewinsky Scandal and Columbine School Shootings. At the same time the World Wide Web was making a rapid rise in the American home, business and classroom. 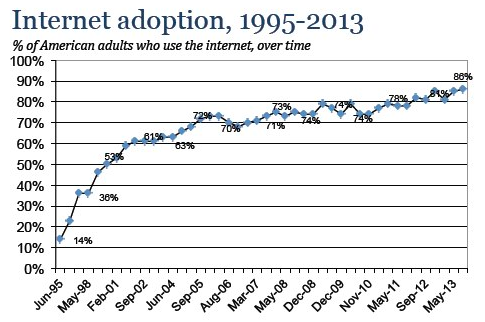 So by the time Newspapers were reaching this peak level of revenue, adult adoption rates of the Internet had reached around 60% up from barely 20%, 5 years earlier. However this in and of itself was not the only thing that was changing. Broadband or faster internet access was becoming more prevalent. During this period up to 2002, companies like Google, Amazon, Yahoo, eBay, PayPal, Monster and Salesforce were launched. Mobile phone adoption (albeit of what we call now the dumbphone) was on a fast rise and the iPod revolution was beginning. So the answer is not that suddenly people did not need to advertise their job ads in the New York Times because Monster.com was a better option nor that they could far better target direct response advertising on search engines like Google and Yahoo where the audience intent was known thus meaning far better ROI. It is that simply people’s behaviors and expectations were changing. Also younger people were doing this in far greater numbers meaning that the behavioral changes were only accelerating. They could get instant access to news via the cable channels and they could get instant access to information via the Internet. Businesses saw this change and many adapted (or if they didn’t then are either dead or a irrelevant today) diverting evermore marketing dollars but the newspaper industry riding high on record revenues decided little need to changed with their print business and most decided just to replicate their print news online for those few that were on the internet for free. They didn’t realize that the days of marriage and death announcement in the paper were going and print classifieds were more useful to cover floors while painting than for the information itself. The working theory is that to cover news at a global scale that you need highly paid and educated journalist, large news bureaus, foreign correspondents and ultimately time to research, develop and check a story. This goes for print as much as it does for TV broadcast news. This is of course all very expensive and thus needed those ad dollars to fund this effort along with subscription fees. After all isn’t a free and functioning press essential to a robust democracy? Gutenberg’s invention of the printing press some 600 years ago (although some credit a Chinese invention 1,000 years ago as the first press) was said to usher in the seeds of the information age and universal enlightenment. It is just the many thing the way we mass produce information in this Social Media, Fast Food, Talking Heads, Have To Be First So Broadcast Now and Retract Later era that we are somehow insulting that ideal. It is true that there is far more noise and misinformation in the “media” today and proportionately a lot more idiots employed as “journalists” today than every before. Combined with the more frivolous parts of social media and there is a strong argument that we are being dumbed down as a society. On the flip side a child in a developing nation in Africa with a smartphone has more information at his fingertips than President Reagan did during his tenure. So even with the growing military, industrial, NSA and technology apparatus of the entire US government in 80s (during Cold War era) and the most powerful person in the world can’t compete with a poorer child from a poorer nation today. This universal spread of information has led to positive change at the national and micro level that prior revolutionaries down to people working with local community issues could only dream about. This information that people are accessing is not from the major media moguls but personal blogs, YouTube videos, Instagram photos, tweets on Twitter, discussion forums and the ever growing number of digital and mobile first/only news portals. In other words over the last 10 years many new media sites have popped up as well as aggregator portals resulting in a seismic shift away from eyeballs on traditional media outlets for the majority of our attention. Many of these are niche or single issue focussed but other are mainstream with far leaner “news rooms” designed specifically for the digital era thus allowing their economics to trump any of the traditional outlets. Although many of these same outlets do accuse the new outlets of largely building their stories off the hard work of their reporters and infrastructure. 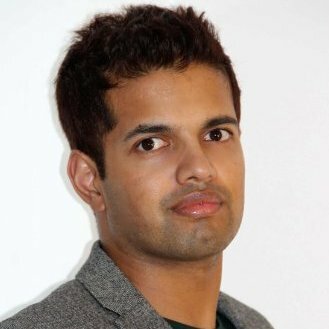 Some of these new outlets and aggregators include (and many of them have been since acquired); Huffington Post, Google News, Pando Daily, Digg, Reddit, TechCrunch, Mashable, Business Insider, Yahoo News, Slate, Salon, Flipboard, Twitter, Buzzfeed, Upworthy, Politico, Breitbart, Perez Hilton and most recently Facebook’s Paper. It is an ever growing list and one that already despite many of their short lives elicits strong opinions of the brands to their overall worthiness as legitimate news outlets. Many of these sites like Buzzfeed, Business Insider and Huffington Post have been accused of creating click bait type headlines (i.e. teaser headlines promising major bombshells) only to largely give you scant short form articles with little analysis, depth of thought or new information versus other outlets. However in fairness to all of them they do also have longer form content, a lot of variety and cater to the type of population that historically would be reading the USA Today, People Magazine, NY Post, CNBC and watch E TV for their news sources. That is a lot of people and in any society not every news source will be The Economist, BBC, PBS, Al Jazeera or NPR. At the end of the day news is largely a business in most societies and even most of the “free” thought publicly funded institutions still rely heavily on the general public for both donations and/or their time to produce content at below the commercial market rate. All of the modern news sites have been built with this in mind and funded accordingly and most of them are expanding with foreign bureaus and additional writing staff. Pando Daily’s Mark Ames wrote two brilliant pieces recently about an unknown Congressmen who fought against the NSA and Government security establishment in the 1970s as well as little cover tech companies illegal salary collusion scandal involving people like Steve Jobs. Even Business Insider in recent times have done in depth profiles of a tech founder who was long celebrated but tragically ended his own life as well as Time Magazine like in depth profiles of Marissa Mayer, CEO of Yahoo and Tim Armstrong, CEO of AOL. In fact when you even see journalists like Glen Greenwald, formerly of The Guardian who broke the Edward Snowden and NSA stories in 2013 leaving to form of their own digital news outlets I think potentially we are in good shape as a society going forward or at worst no worse than we are today.